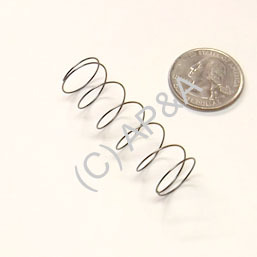 Standard coil plunger compression spring used on many different pinball devices including flippers on older vintage games, pop bumpers, kickers, and more. Fits most makes and models. Measures approx. 1-1/2 inches long, 1/2 inch diameter. Replacement for Bally # SP-200-19, SP-200-175, SP-200-180, SP-200-189, SP-200-196, SP-200-212, Gottlieb #s 21643 & 32100, Williams # 10A-135, Data East/Sega/Stern # 266-5047-00, Stern # 5A-151, 5A-164.